Over the weekend, the Ice Storm in-game event began in Fortnite, bringing with it some new challenges. The Ice King unleashed an icy storm on the map, which is now covered in snow. New challenges unlock every day and if you complete all 13 challenges you’ll be rewarded with the Winter’s Thorn Glider. As an incentive, you’ll also receive the Blue Metallic Wrap once you’ve completed six of the Ice Storm challenges. You’ll need to defeat 250 Ice Fiends for this challenge. These zombie-like creatures spawn near Ice Shards, so focus on defeating them and their brethren rather than trying to destroy the Shard. You could make good use of traps when fighting the horde, as well as using Automatic or Explosive Weapons like a Rocket Launcher. Given that another challenge involves using Explosive weapons, we’d go with the latter. You’ll have to inflict 5000 damage on the Ice Legion for this challenge. Don’t be daunted by the number; if there’s a large group of Ice Fiends and Brutes kicking around, you’d be surprised by how much damage you can do using a Grenade Launcher. These guys are the bigger, hardier brothers of the Ice Fiends. Defeating them requires significantly more firepower, so make sure you can a weapon like a Shotgun equipped and maybe leave a Trap nearby for extra damage. You’ll need to take out 100 of these bad boys to complete this challenge, as they spawn less frequently than the Fiends. You’ll find Ice Brutes close to the Ice Shard, accompanied by a bunch of Ice Fiends. This challenge is pretty straightforward, given that Pistols and Assault rifles are readily available. You’ll need to inflict 10,000 damage to the Ice Legion using Assault Rifles or Pistols. You can be easily overwhelmed by a large horde, so try tackling this challenge in a Duo or as part of a Squad. If you manage to find a Heavy Assault Rifle, you can take a few steps back and just mow down enemies quite easily. Ranged Ice Fiends are a taller version of the normal Ice Fiends, except they also throw snowballs that could take you out quite quickly. Weapons such as the Crossbow or Sniper Rifle would be best to take down the 150 Ranged Ice Fiends necessary to complete this challenge. Again, doing this as part of a Duo or Squad means that you can take turns using Assault Rifles and Sniper Rifles, and have one person keeping an eye out for other players. The Golden Ice Brutes are by far the most formidable enemy in the Legion. You’ll need to take down 20 of these and your best bet is to use a mix of Traps and the Crossbow, which inflicts extra damage on Fiends. Golden Ice Brutes tend to spawn in the latter half of a match, so watch your flank for other players. For this challenge, you’ll need to deal 2000 damage to the Ice Legion by defeating different types of Ice Fiends and Brutes. You can use any type of weapon you like, but you’ll have to do all the damage in a single match to complete it. This challenge is also slightly more difficult, as you’ll need to find and destroy 10 Ice Shards in different matches. Destroying an Ice Shard means that Ice Fiends and the like will stop spawning, so get ready to run from opponents who might not be very happy that you’ve destroyed a spawn point. This challenge would be easier to tackle as part of a Duo or Squad, as would any of the previous challenges. Elite members of the Ice Legion glow brightly and take the form of an Ice Fiend, a Ranged Ice Fiend or a Brute. They spawn less frequently, usually closer to the endgame or when an Ice Shard is rapidly losing health, and you’ll need to take down 100 of these elite members to complete this challenge. They have a higher HP than normal members of the Ice Legion, but there’s no one way to take them down, so grab whichever weapon you can. Whether you’re using a Shotgun or an SMG, you’ll need to deal 10,000 damage to the Ice Legion for this challenge. Again, this one is fairly straightforward, so don’t be put off by the number as kills quickly add up. 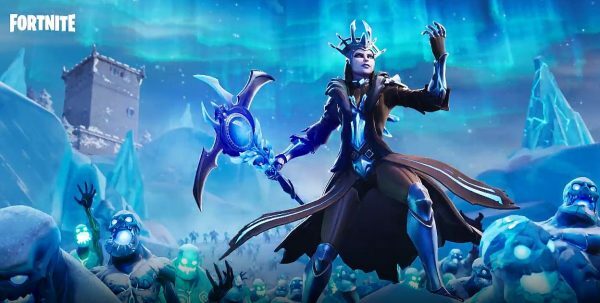 The post Fortnite Ice Storm challenges – how to destroy Ice Fiends and damage Ice Legion appeared first on VG247.